Usual suspects outside Downing Street including that dreadful Emma Dent Coad of Grenfell Tower fame. N.B. 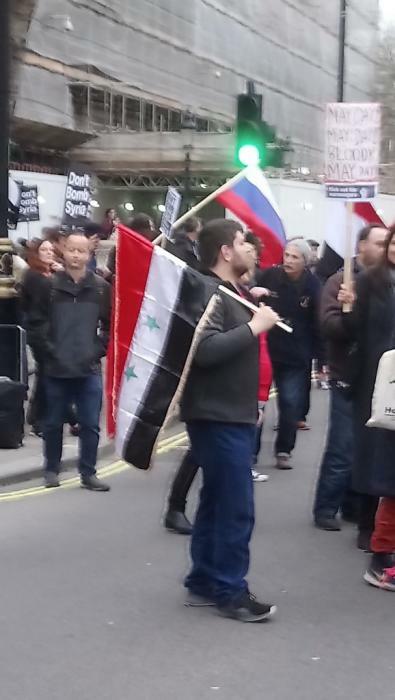 Russian and Syrian flags. Well I did not think it would happen, but it has and I think Mr Trump address to us was a very good one. I like rest of the world do not know or how all this will end up. But I hope will be sorted out in my life time and the world can live with each other better then it does now. 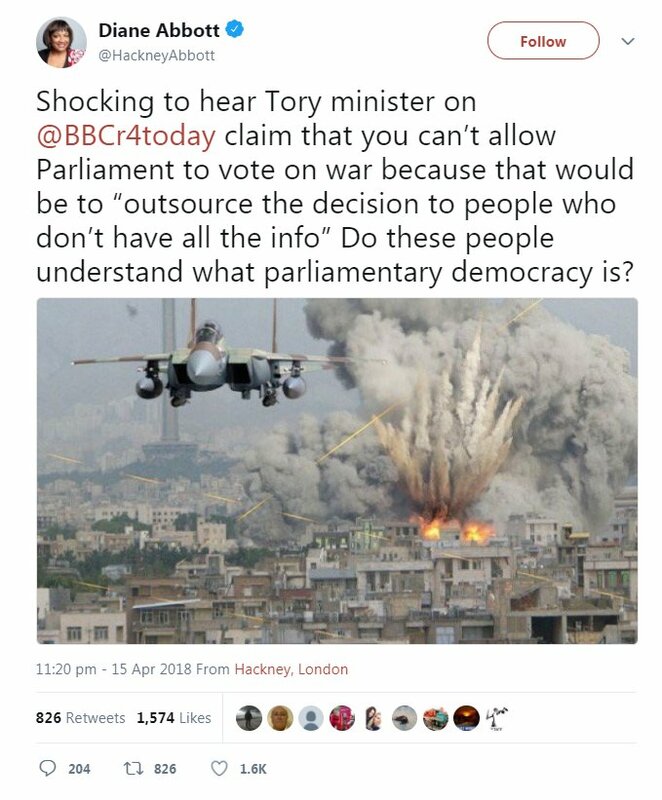 What do the UK’s airstrikes against Syria mean? First, that it has stood with its allies against the use of chemical weapons by the Assad regime to butcher its own people. Even amid the horror of the past seven years, chemical weapons — illegal under international law — are particularly indiscriminate. The second important feature is that Russia has been confronted over how it is acting in cyberspace, in social and state-controlled media, in Crimea and Ukraine, in its relationship with Nato, in the nerve agent attack in Salisbury and in its support for President Assad. In terms of targets, the stocks of chemical weapons, the facilities that produce them and the aircraft that deliver them will have been top of the list. 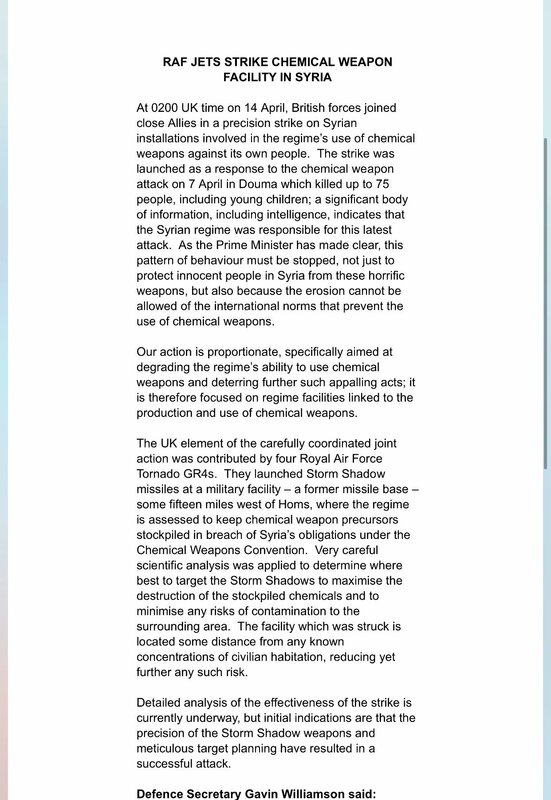 But to deter and prevent as well as punish, strikes may also take place against the leaders who chose to employ these weapons, command and control facilities, logistics, airfields and defences around chemical weapons. The technical challenges of identifying targets and the absence of surprise suggest that strikes may have to continue for some time for decisive results. If not, the response will only be “event management”, not a campaign to eradicate the threat to the remaining civilians resisting Assad’s regime. The strikes also mark a profound change to the way that the West approaches conflict in the 21st century. In Iraq and Afghanistan there was no real challenge for control of the air. In Syria the strikes must overcome the serious threat posed by comprehensive Russian-backed air defences. Western forces are used to flying drones freely and unlimited access to space-based communications and GPS. This does not apply here. There is also the question as to how this use of force will be linked and subordinated to strategies for bringing the fighting in Syria to a rapid end and for resetting relations between the West and Russia. In the latter case, the use of force is always competitive and reciprocal and Russia may not confine its response to Syria. We should not be surprised if we detect major intrusions into US, UK and French cyberspace and social media. These risks are a feature of modern confrontation. in deploying the political will, the national moral courage and the military skill to prevent the further use of chemical weapons in Syria, we may find that what is right and necessary comes at a cost. We will have to be resilient or risk being treated as a strategic snowflake, with great consequences for our future security and prosperity. General Sir Richard Barrons is former commander of Joint Forces Command. All's well that ends well if the claims made by the allies are correct and Russia don't seem too bothered. The PM will come under pressure due to not giving MPs a say but if there are no more strikes then it will all calm down and other issues will come to the fore. Always the way that the West handles these things thinking that regime change will be instrumental in bringing peace despite us creating a vacuum that leads to lawlessness or civil war. Our leaders don't seem to understand that nobody likes a foreign army on their soil or being presented with a puppet Government, we wouldn't. i am absolutely against these new attacks its not how we should be dealing with issues and to hear we have lovingly left the chemical factories standing makes me wonder what the hell is dippy May and her sub Tramp sorry Trump playing at ???? end of the day May does not have the majority she should not of gone with her own opinions . Another issue is of course that we have spent all that money on firing missiles and now we have no magic money tree to buy replacement missiles. I do know they have a money box in case this kind of thing comes up. 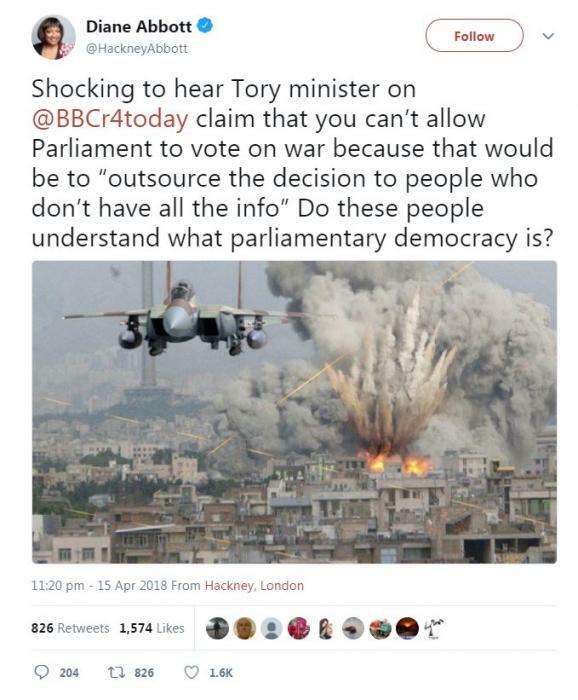 There are two things where the government of any colour can always find the necessary money, an increase in MPs pay and war or peace keeping mission as these conflicts usually get called now. 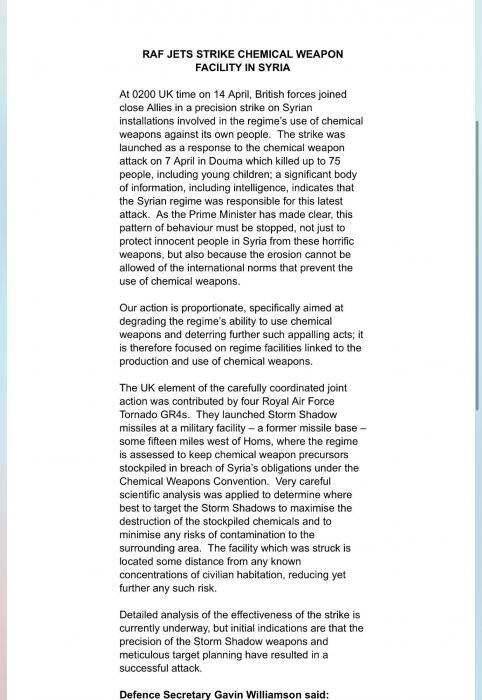 Boris admits the air strikes may not even stop more chemical weapon attacks and in exchange the Russians could seriously damage us with cyber attacks. I haven't seen anything in the Guardian to suggest that they're doing anything other than uncritically mirroring the official state story here, RH, though it's a narrative with so many holes in it as to embarrass a colander. And that was the case with Ewen MacAskill's piece, to the point where, rather than pick up on the deliberately misleading language in Sedwill's letter, he explained it away. Besides, it seems that the Guardian online have been putting in permanent moderation any comments questioning either the paper's approach or the official version. As for the 'cognoscenti', bless 'em, I suspect that if HMG's colour was red they'd be tearing the tale apart, and quite rightly too. But it's worth noting that their natural totalitarian tendencies show up when they accuse any dissenter of lining up with 'the enemy' (whoever that might be this week). I would hope that, should they ever find themselves on the wrong side of the law, they're unfortunate enough to encounter a jury with more respect for its lunch than for the evidence. A British attack submarine has been locked in a “cat-and-mouse” pursuit by Russian submarines and warships, military sources revealed. While Theresa May was deciding last week whether to launch strikes against Syria, a drama began beneath the surface of the eastern Mediterranean. A Royal Navy submarine armed with cruise missiles is believed to have been hunted by at least one, and possibly two, Russian submarines dubbed “the Black Hole” by western naval experts because they are so quiet. Two Russian frigates and an anti-submarine aircraft are also thought to have been searching for the British boat as it manoeuvred to put its Tomahawk cruise missiles within range of Syrian military targets. The Astute-class submarine is believed to have spent several days trying to evade detection in a tense and dangerous contest. Russian and British submarines have increasingly stalked each other in the north Atlantic, North Sea and Mediterranean in recent years as tensions have grown. This is believed to be the first time an underwater duel has taken place in the build-up to strikes. The British submarine has been protected by the US navy, which began flying P-8 maritime patrol aircraft over the eastern Mediterranean last Wednesday to track Russia’s ships and subs. The P-8 has sensors to find vessels and can deploy missiles, torpedoes and mines. Kilo-class Russian hunter-killers, stationed at Russia’s naval base at Tartus in Syria, are believed to have led the hunt. They are powered by two diesel generators and an electric drive, which allows them to operate extremely quietly, and can be armed with torpedoes, cruise and anti-ship missiles. “The two Kilos would be a considerable threat,” Iain Ballantyne, author of The Deadly Trade, a book on submarine warfare, said. Britain’s submarine has limited firepower. It is likely to have been carrying no more than 20 Tomahawk cruise missiles, which it can fire 1,000 miles while submerged. Some American submarines can carry 154 Tomahawk missiles. Nick Childs, a senior fellow at the International Institute for Strategic Studies, said the Ministry of Defence was likely to have a stockpile of fewer than 100 Tomahawks. The stupid fat woman (aka Shadow Home Secretary) can't help it can she? I hope that they check the batteries are all fully charged first! I was under the impression that light-sabres exist only in a parallel universe. If so, isn't this like phoning the police to report the Tooth Fairy for breaking and entering? you can buy one in toys are us,batterys are extra. Pleased that Salisbury, Trump and Syria are all mixed up in the same thread, as that's exactly as it should be. The problem in each case either caused or exacerbated by Russia?